Do you know the difference between pour over coffee and regular coffee? Pour over coffee is one of the most popular methods for making coffee across many homes and cafes. In fact, many coffee aficionados believe that pour-over brewing produces the best coffee. For those who aren’t familiar yet, the pour over method is a completely manual way of preparing your coffee. It gives you complete control over every single step of the coffee making process. You can adjust the coffee grind and pour over coffee maker based on your personal preferences. For all you coffee lovers out there ready to start manually preparing exceptional coffee at home, we’ve compiled a list of the 10 best pour over coffee makers out there for you. 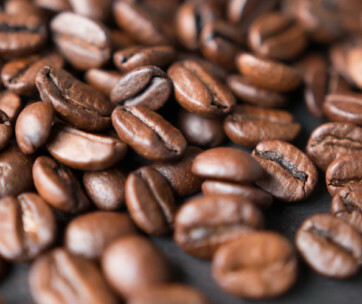 Craving a coffee with a rich and bold flavour? 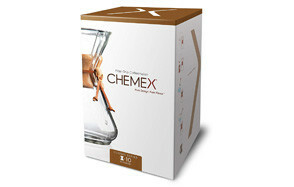 This Chemex Glass Coffee Maker is designed to deliver the purest flavour experience for you. The elegantly designed coffee maker is made of non-porous Borosilicate glass, which doesn’t absorb any odours or any chemical residues. It delivers only the flavour of the coffee itself. You can also cover it easily and store it in the fridge to reheat later, and it won’t lose the flavour of the coffee over time. This coffee maker also looks stylish in your kitchen with its glass build, polished wood collar and leather tie to finish off. This Coffee Gator Pour Over Brewer comes with a hand drip eBook which explains exactly how to use it to produce a fantastically flavourful cup of coffee. The carafe has a mesh filter and is 100% BPA-free to deliver optimum flavour. The excellent coffee you can produce using this coffee maker is exactly what you would expect to find in any high-quality coffee house. In fact, Coffee Gator pride themselves on what they call their ‘barista-quality coffee’. Put them to the test by trying out this great looking pour over coffee maker. All Coffee Gator brewers are constructed in an environmentally friendly manner and are delivered with stainless steel filters. There’s no need to worry about the wastage of paper filters or the hassle of cleaning cloth filters with this product. These Hario coffee drippers are produced using durable ceramic material in Japan. They have been cleverly designed to deliver hot and flavourful coffee each time. The use of ceramic means the temperature of your coffee remains consistent throughout the entirety of the brewing cycle. The coffee drippers are also cone shaped to enhance the flavour of the coffee, with spiral ribs to allow for expansion of the coffee. You can use this coffee dripper with either paper filters or cloth filters, depending on your preference. 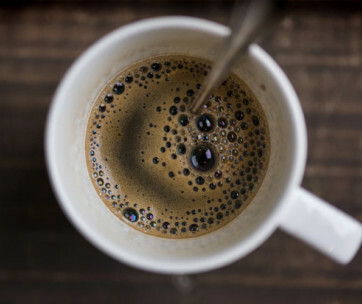 There is one single hole at the bottom where the water flows through, and the taste of the coffee can change depending on how quickly you pour through it. This is a great choice for those of you who are ready for a very hands on coffee brewing experience where you have complete control though out the entire process. 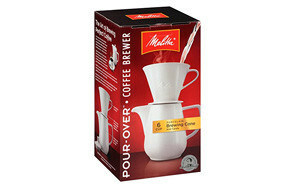 Pour over coffee brewing was actually invented by the founder of this brand, Melitta Bentz, all the way back in 1908. That bodes well for its product range! This specific Melitta porcelain drip brewer is cone shaped for maximum flavour and comes with a porcelain carafe that can hold up to six cups of coffee. You can even get cone shaped filters from Melitta to go with it, with the #4 Melitta filter recommended for use with this product. 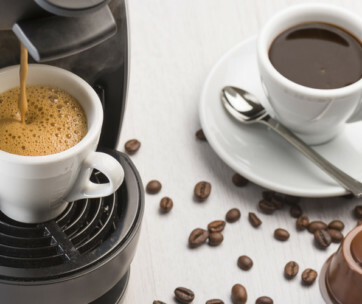 This coffee maker is a good choice for those of you who are often brewing coffee for larger groups, as the carafe can hold up to 36 ounces of coffee at a time. Not only does it look extremely sleek on your kitchen countertop, this Bodum coffee maker comes with a permanent mesh filter made of stainless steel which helps retain the flavour of your coffee. The Bodum team believe that paper filter can absorb the essential oils and flavours of coffee, which is why all their coffee makers come with stainless steel filters. The carafe has been manufactured using a durable and heat resistant glass material. You can make up to 8 cups of coffee at a time using this elegant looking coffee maker, and it’s easy to clean in the dishwasher. You can get it in a variety of colours, but we love the look of the black one ourselves. This Osaka Coffee Dripper comes with a full brewing kit to give you everything you need to produce an excellent pour over coffee at home. This makes a good choice for those of you who have never brewed coffee using the pour over method before. The Osaka Coffee Dripper Starter Set comes with a hand-blown glass carafe which has a lid to keep coffee warm for longer, and a handle for easy pouring. There is also a coffee measuring spoon, a cone dripper made of stainless steel, and a drip tray included. This starter set could make a great gift for any of your friends or family that you know would love good quality coffee easily brewed at home. The set comes with plenty of tips and advice on how to get the most out of this product. You can also pour it into your coffee thermos and carry it wherever you go. The red version of this Osaka Coffee Maker is perfect for adding a splash of vibrant colour to your kitchen. The colourful collar not only looks great, it is also heat resistant. This makes it easy for you to hold and pour from the carafe no matter how piping hot the coffee inside is. This handy set includes a glass carafe with a lid, cone dripper, coffee spoon and drip tray, and you can get it in a range of colours. This Pour Over Coffee Maker Kit by Coffee Panda comes with a premium glass carafe and a stainless-steel filter. There is also a coffee scoop and a heatproof trivet included to help you brew that perfect cup of coffee. The fine mesh filter has been designed to ensure that not a coffee ground makes its way into your coffee cup. The carafe is dishwasher safe so you won’t need to worry about the hassle of cleaning up after. Coffee Panda send all their customers a barista e-book to help you pour the best cup of drip coffee possible. Hario is a Japanese phrase which literally translates to ‘King of Glass’. And the brand clearly knows high quality glass, with this excellent heat-treated glass coffee maker. You can only make 1 to 2 cups at a time with this product though, so it may be a better choice for smaller households. The coffee comes out with a rich flavour and the design is quaint and unusual with a stylish wood neck pot. You’ll find this product is easy to use, but the cloth filter takes a little more time to clean. This elegant looking set comes with a glass dripper made of hand blown borosilicate glass. 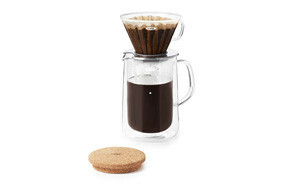 The lid is made from an all-natural cork material to help keep your coffee as hot as possible for as long as possible. OXO Good Grips also comes with 10 filters that have been especially designed for use with this dripper. However, you won’t need to keep repurchasing these as regular paper filters can be used with it as well. To help keep the coffee maker stable while brewing, it has been designed with a stainless-steel ring and silicone pad underneath. Start by grinding the coffee beans. We’d recommend a standard medium grind to start with, and then you can adjust based on your preferences. Boil the water. Simple enough. Wet the coffee grounds. Pour a bit of water over the coffee grounds and let them sit in it and bloom for at least 30 seconds. Pour the water. The pace at which you pour can adjust the flavour of the coffee quite a bit, so try it at a few different paces until you find one that you like. Drink up! Sit back and enjoy your steaming cup of exceptionally flavoured pour over coffee!